Do you want to work from your comfortable home and get paid by writing books? If youre feeling nervous now that youre about to start this project, relax. Tell yourself that you will take it step by step. 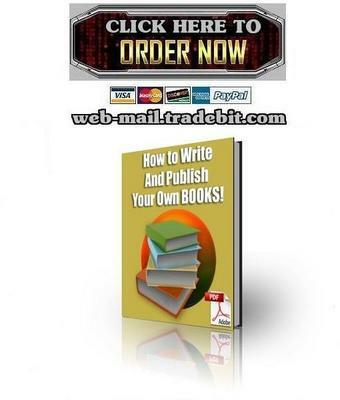 All you need to do is work at it steadily, a word, sentence and paragraph at a time, and you will complete your proposal, and then when youve sold the proposal, youll complete your book using the same easy-does-it method. While were at it, lets dispel a few myths. It takes persistence. There are as many different kinds of writers as there are people. Some are young, some are elderly, many are in-between. You dont need any special writing talent to write books, nor do you need to be highly educated. Many successful writers have never completed high school. If you can write well enough to write a letter, you can write a book. Many professional writers make incomes that would make doctors and lawyers envious. Most make reasonable incomes. If you decide to make a career of writing nonfiction books, the major benefit is that if you choose your books topic with care, your book can stay in print for many years. For each year that your books in print, you get two royalty checks. Lets say that you write two books a year for five years. At the end of the five years, if your books all stay in print, youll be getting ten royalty checks a year. These ongoing royalties are your nest-egg, profitable investments in your future. The blurb is the back cover material for your book --- the selling points which will get people to buy the book. If you write the blurb before you write an outline, youre guaranteed not to wander off the track as you write your book. Writing the blurb will keep you on-track as you write your proposal and your book. Ive included two sample blurbs from my published books to show you how to write a selling blurb. The fast and easy way to research your proposal you may not need to do any research at all. You may already know all you need to know. Seven days, and youre done! How to write the professional way, and a step by step easy way to revise. How to Write and Publish Your Own Books also includes a complete, selling proposal, which got a contract from the first agent who saw it. Order Right Now At An Incredibly Low Price Just $4.99!